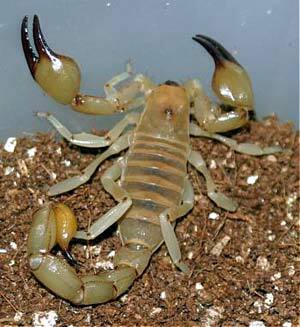 The Scorpion - it is the largest among insects, and more dangerous than any of them. his frightful creature is several times mentioned in the Bible. It is the largest among insects, and more dangerous than any of them. It is sometimes found in Europe, and is there about four inches long; but those of hot countries are sometimes more than a foot in length. The scorpion is very easily made angry, and then its sting is terrible; it very often causes death, but not always. In Revelation, 9:5, 6, we read, "And their torment was as the torment of a scorpion when he striketh a man; and in those days shall men seek death and shall not find it: and shall desire to die, and death shall flee from them." This shows that the pain caused by their sting is very great. When a person has been stung by a scorpion, the part around the wound swells and becomes very painful, the hands and feet become cold, the skin is pale, and there is a feeling as though there were needles in every part of it. This pain often increases and rages until the person dies in great suffering. It is well for man that scorpions destroy each other as readily as they do animals of a different kind. It is said that a hundred were once put together under a glass, where they immediately began to attack and kill each other; so that in a few days only fourteen were left alive. I have heard that if a circle of alcohol or spirit of any sort, is set on fire, and a scorpion placed within it so that he cannot get out on any side, he will sting himself so as to cause his death. I am not certain that this is true, and it would be a very cruel thing to try it even upon so dangerous an animal as the scorpion. It seems that this creature was sometimes seen in the wilderness through which the children of Israel passed. When they had nearly reached the end of their journey, Moses reminded them to praise God for having kept them safely in so many dangers, while passing through "that great and terrible wilderness, wherein were fiery serpents, and scorpions and drought; where there was no water." Our Savior asks, "If a son shall ask of his father an egg, will he give him a scorpion?" The scorpions in that country are about as large as an egg, and when rolled up look a little like one. Yet no father would be so wicked as to give one to his child instead of the egg which he needed for food. Christ once said to his disciples, when they were going out to preach and to heal the diseases of the people, "Behold I give you power to tread on serpents and scorpions, and nothing shall by any means hurt you." This was a very wonderful power; and whoever should see one of those disciples tread on the terrible scorpion without being hurt, would know that Christ was surely with him to take care of him.